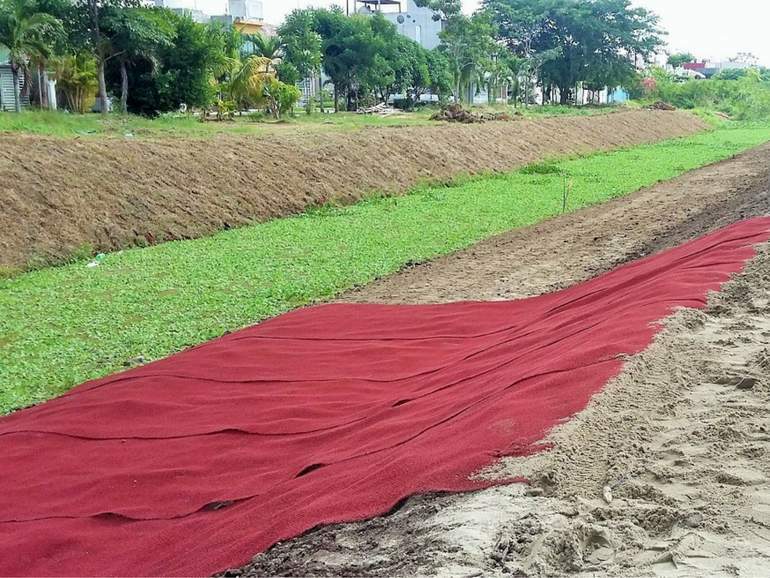 The Secretary of Territorial Planning and Public Works of the State of Tabasco wanted a solution to protect the banks of a channel adjacent to the Lagunas residential area in Villahermosa. We installed our erosion control geomat MacMat to protect the slopes and help promote revegetation. The protection of the environment has been one of our corporate goals since we first offered hydraulic works solutions and erosion protection solutions over 100 years ago. This application area involves protecting vulnerable soils, reducing erosion through stabilization. Therefore, the Secretary of Territorial Planning and Public Works of the state of Tabasco approached us for an erosion control solution to protect the banks of a channel adjacent to the buildings of the Lagunas residential area in Villahermosa, Tabasco. Previously, an unsuccessful attempt to protect the banks was made using grass rolls but these only lasted until the first rainy season. The poor quality of the soil did not allow the vegetation to become fully established. Therefore, we proposed the use of MacMat, one of our erosion control geomats which unlike grass rolls, protects the seeded soil from run-off and helps the vegetation to establish. MacMat is a three-dimensional erosion control mat manufactured from tangled polypropylene mono-filaments, heat bonded at the contact points. Its main application areas are slope protection and erosion control. During heavy rains, the mat prevents erosion due to rain fall impact and run-off and protects the otherwise vulnerable vegetation. As plants grow within the mesh, their roots become entangled within the MacMat which further reinforces the root system. For this project 1,267m² of MacMat 9.1 was used. To read more about this project click here to download our case history.